A preview of your worksheet will be displayed if your browser supports this. Each browser has different features on the preview, but most have "print" and "download" buttons. In the picture above taken using the Google Chrome browser you can see these buttons indicated by the red arrows. Portable Document Format (PDF) is a common computer file format for materials intended to be printed. Most computers and devices have pre-installed software that can handle PDF files. If your computer does not have a PDF reader pre-installed you can download the Adobe Acrobat Reader here for free. Click on the "Open as PDF" button to open the PDF file in your browser. You can then use your browser's "Save" and "Print" functions to save the file to your computer's disk or print it. Click on "Download as PDF" to save a copy of the PDF on your computer. This will usually save the worksheet to your computer's "Downloads" folder. You can then move it from the Downloads folder to wherever you want to store it. We recommend saving a PDF of all worksheets you create on your own computer or device. Worksheet PDFs will be either A4 or US Letter paper sizes. You can switch between them using the relevant Output Option before you finalise your worksheet. In the unlikely event that your device is unable to read PDFs you can click on "Open as HTML" to open your worksheet in your browser. From here you can also save and print using the functions built into your browser. 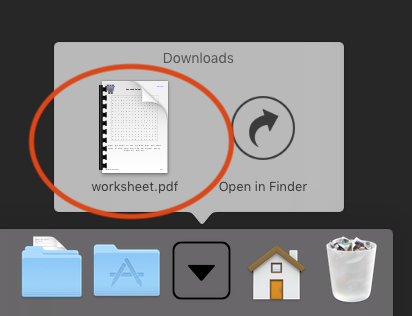 If you want to change your worksheet content or adjust the worksheet generator settings you can dismiss the "Worksheet Ready" dialog by clicking on the (x) in the top-right corner. You can then make further changes and click "Make and Save Worksheet" to re-make your worksheet with the updated content or settings. If you have a Pro account you can also use the "FinalTouches Editor" to change pretty much any of the final content with a word-processor like interface. Click here for help on how to use this feature.